I was researching into HCG recipes and there is a fair amount of Asian recipes, mainly because they are pretty much always fairly light anyway and never use too much in the way of meat. 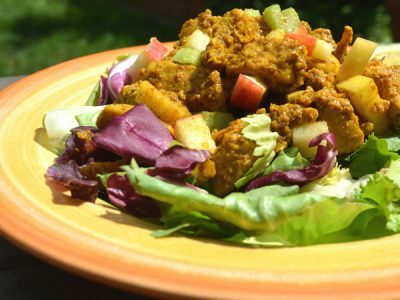 I started to think, how about adding a few Indian recipes in here, they are always tasty, just leave out the yogurt or cream and this really worked with this Curried Chicken Salad so much so that it is a salad favourite in our house! HCG diet or not you can always eat this salad and of course you can always add some light yogurt to the curry mix once cooled. Add all the dry spices to the 1/4 cup of water and stir well to combine the spices, then reduce the heat and simmer until the liquid reduces to form a thickish sauce and the chicken is cooked through. You may need to add water as needed to create the consistency you want. Chill in the fridge, then just before serving stir in the chopped apple and celery then serve on a bed of green salad!